We are the Sweets! What is a "Sweet"? The name refers to the infamous (and delicious) Walla Walla sweet onions, one of the dominant crops grown in our beautiful town. While Whitman's official mascot remains the Blues, we hold true to our love for our quirky alternative, especially as it has led to many a good cheer ("Let's go Sweets! ", "LGS", "Let's go LGS!"... redundancy is key folks). As for the team, we're a fun lovin', hard workin', passionate group of gals who love Ultimate. We come from many different Ultimate backgrounds, loving that our team is comprised of those who've grown up with the sport as well as those new to the beautiful game. In addition to ballin' hard on the field, individual Sweets can be found doing a wide variety of activities around campus like climbing at the rock wall, doing research with the Biology department, writing for the Wire (Whitman's student run newspaper) and more! 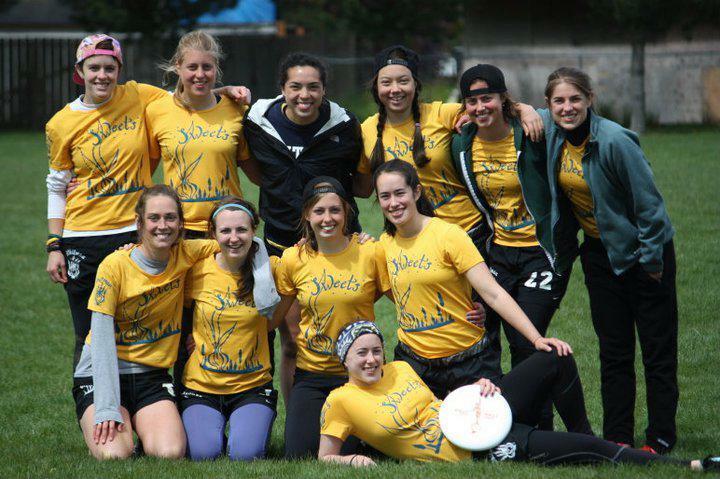 Ultimate Frisbee became a club sport at Whitman College in 1992. Since then the program has grown a lot, but we still hold on to our traditions: inclusive community, excellent cheers, coed fall, Saturday team brunch, and the Annual Onionfest in the spring. But wait, how has our program grown? Let's just say the same players that used to go to tournaments with only 7 or 8 girls became seniors leading our team of 30+ players. In the 2014 season, we qualified for D1 Nationals for the second consecutive time in our program's history. The team travelled to Cincinnati, OH where we placed 15th in the nation. We are excited about the progress our program has made in the past few years and are looking to continue that growth! This past season the Sweets qualified for D1 Nationals again! We travelled to Milwaukee, WI and placed 16th in the nation! In the 2016 season we won the Stanford Invite. We placed 3rd in our region and qualified for DI Nationals in Raleigh, North Carolina. We placed 2nd, losing only to Stanford in the finals. We just want more ladies to be able to come play with us! As much as we love playing Ultimate, we love our team traditions. GO SWEETS! 80s Scrimmage - A knee-friendly scrimmage which is adapted from the Stair Challenge tradition, in which we wore neon and spandex and ran every staircase on campus. The Hat Tournament - This is the first coed (in-squad) tournament we play in the fall. If your hat falls off, that's a turn! Civil War - A coed (in-squad) game we play the last day of class in the Spring. If you lived in Anderson or Prentiss as a first-year...you're the South! If you lived in Jewett, Lyman, or North as a first-year...you're the North! Onionfest - This Spring tournament is our biggest fundraiser and a chance for our alumni to travel back to Walla Walla and play some good ole Ultimate against our current Sweets (along with 20 other club and college teams)! The taco truck makes an appearance at the showcase game, so you can eat a burrito full of Walla Walla sweet onions while you watch the halftime onion eating competition. Who will be the next reigning champ? Chorale Contest - The ladies participated in the 2013, 2015, 2016, and 2017 annual choral contest. In 2015 and 2016, Alex Hardesty arranged our performance. Last year we sang Chance the Rapper and the Archies! Who knows what we will sing next year or if we'll even sound good, we're just so happy to get to spend even more time together!